In the spring of 1948, UCLA graduate student Ken Norris was eager to return to his field research site in the Coachella Valley, where he’d spent previous seasons crouched in the sand dunes, observing the desert iguanas that scurried beneath the Dicoria bushes. When he arrived at his research plot, however, he encountered a foreboding sight: survey stakes impaling the desert floor. 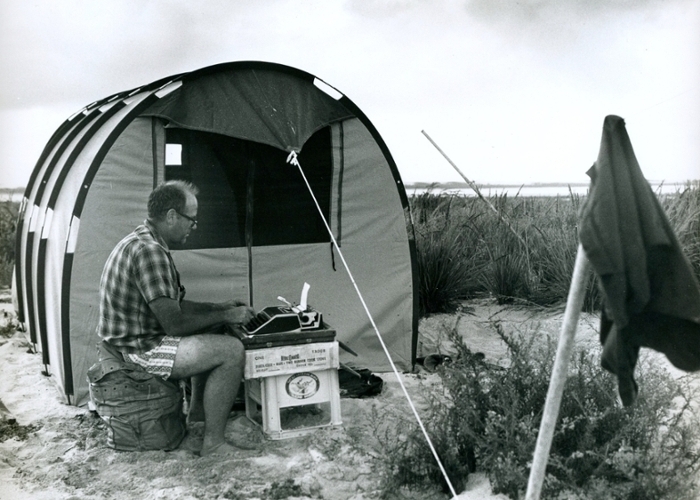 The next time Norris returned, more than half his research site had been planed down to flat sand. The Dicoria bushes—and the desert iguanas they had sheltered—would soon be replaced by a motel complex. Norris’s research project was forced to an early end. Norris’s thesis advisor, zoologist Ray Cowles, also lamented the loss of these wildlands where he’d conducted research and trained future scientists. Cowles had even tried to persuade the University to adopt natural areas for the purpose of teaching and research—but his efforts were futile. Along with unprecedented population growth and urbanization, the post-World War II era marked a paradigm shift in university science programs. With technological advances stemming from the war effort, research institutions prioritized “Big Science,” exclusively funneling support toward the physical, molecular, and biomedical sciences. Norris and Cowles watched as traditional field-based sciences began to fall by the wayside. 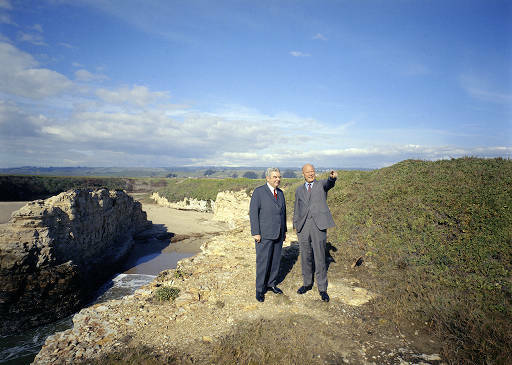 Norris brought a proposal created by senior faculty to President Kerr and by January of 1965, the UC Regents established the Natural Land and Water Reserves System, which was eventually renamed the Natural Reserve System (NRS). The approval allowed Norris to explore California's vast wildlands to survey potential reserve sites. He reviewed 81 sites, 13 of which were initially incorporated into the NRS. Roger Samuelsen, the first NRS director, credits Norris as a great visionary. But equally important, he says, was Norris’s warm, open demeanor. In 1972, Norris moved to UC Santa Cruz as a professor of natural history. During his first few years, he co-founded the Long Marine Laboratory and the Institute of Marine Sciences. The land and lagoon used for the research campus was donated by Donald and Marion Younger, whose family had owned a ranch for over a century—establishing the first UC Santa Cruz natural reserve, officially incorporated into the UC-wide NRS in 1986. From humble beginnings, the NRS has grown to encompass 756,000 acres across 39 reserves, making it the largest university-administered reserve system in the world. The reserves protect a diverse assemblage of California’s native grasslands, deserts, conifer forests, oak woodlands, coastal wetlands, chaparral, sagebrush and other distinct habitat types—along with the multitude of species these habitats support. Today, the UC Santa Cruz Natural Reserves comprise over 10,000 acres of pristine land on five sites that fringe the Monterey Bay National Marine Sanctuary. From the rocky island habitat of Año Nuevo Natural Reserve to the coastal wetlands of Younger Lagoon Natural Reserve, the maritime chaparral of Fort Ord Natural Reserve, the redwood forests of Landels-Hill Big Creek Natural Reserve, and the wooded hills of the Campus Natural Reserve, UC Santa Cruz Natural Reserves offer living laboratories with diverse ecosystems for scientists and students to learn about the Central Coast in perpetuity. Each year, tens of thousands of researchers, university students and public school students, as well as members of the general public, use the Natural Reserves’ living laboratories and outdoor classrooms to conduct field studies, teach, and learn. Besides providing a protected natural ecosystem in which to set up a research project, many of the reserves offer features to ease the logistics of field research, such as research housing and laboratory facilities. In addition, many reserves are situated near UC campuses, allowing researchers to conduct studies with minimal travel time. For example, Younger Lagoon Natural Reserve protects 75 acres on UC Santa Cruz’s Coastal Science Campus, providing field research opportunities literally right outside classroom and office doors. Only a 30-minute drive to the north, Año Nuevo Island Natural Reserve dedicates 25 acres within State Park land to scientific research, including studies of pinniped colonies, nesting seabirds, and native plants. “The close proximity of Año Nuevo Island to UC Santa Cruz makes it an ideal location for a faculty member to carry out research, but, more importantly, for graduate students to be able to do research,” says Dan Costa, professor of ecology and evolutionary biology at UC Santa Cruz. He explains that the convenient locale allows graduate students to conduct research during the semester, without having to give up coursework or teaching opportunities. Costa adds that without the reserve, he would have to travel to the Antarctic or the Galápagos Islands to conduct much of his marine mammal research. Because reserves are protected in perpetuity, they make long-term data collection possible, allowing researchers to track ecological changes resulting from factors such as disease or climate change over time. “Having a network of reserves across the state makes it possible to document change at any one site or across these environmental gradients that California is full of,” says Erika Zavaleta, professor of ecology and evolutionary biology at UC Santa Cruz. In her research looking at wildlife response to climate change, Zavaleta is grateful to have access to decades of historical weather data collected at the reserves. Through long-term studies at Ford Old Natural Reserve, which shelters a high number of rare and endemic plants, researchers are examining how species interaction and climate patterns affect the persistence of threatened and endangered plants. Long-term data collected at Landels-Hill Big Creek Natural Reserve help scientists understand the ecology of redwood trees throughout their range, as well as how to conserve and manage steelhead populations throughout the state. Zavaleta points out that the same factors that make the reserves attractive for researchers—such as easy access to a natural, intact ecosystem—make them ideal for teaching field courses. UC Santa Cruz in particular has been a leader among schools that utilize and contribute to the NRS—which isn’t surprising; it’s where Ken Norris created the renowned Natural History Field Quarter, a course that takes students into the field for a quarter-long expedition to reserves across the state. Field Quarter is still popular on campus today and is now one of six intensive field courses offered at UC Santa Cruz. In addition to its four other reserves, UC Santa Cruz boasts a Campus Natural Reserve, which encompasses 410 acres of protected natural lands right on the main campus. Here, students can easily experience class field trips, as well as participate in actual research and stewardship activities. “The Campus Reserve provides opportunities for walking outside your class for even a short period of time, without getting on a bus, and doing quick experiential learning that enriches and drives what you do in the classroom,” says Greg Gilbert, chair of the Department of Environmental Studies at UC Santa Cruz. During the 2017-18 academic year, 5,172 students and 625 student and faculty researchers used at least one of the five reserves at UC Santa Cruz. The Campus Reserve alone supported over 50 courses in 2018, ranging in subjects from ornithology and field geology to photography and creative writing. Preserve the magic. For nature. For research. Forever. Rooted in research and dedicated to inquiry-based education, our 10,000-acre reserve system provides unparalleled field experiences for more than 5,000 students each year and informs real-world decisions for the health of our planet. You can make your impact on this critical work today.